What’s cool about the DMG2? The Dungeon Master’s Guide 2 is a great book. Go get it. Go buy it today. That’s my review. There you go. 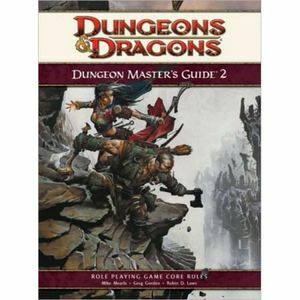 Now, if you want to read about what to expect in the book that’s of benefit to new DM’s, well, then you’ve come to the right place. This book is in many ways superior to its predecessor, adding a storytelling layer to the game that many felt was missing, and has been the cause of many arguments against 4e. This book should silence the naysayers, and if you’re one of them and disagree, tell me why. Let’s take a look at this book, chapter by chapter, and point out what may be some items of interest to new DM’s everywhere. Right off the bat the book aims to silence critics of 4th Ed. who insist it’s nothing more than a miniatures combat game. Here’s the role playing crunch: Award XP equivalent to a monster of their level for every 15 minutes they spend in significant, story-advancing role playing. There it is. Written into the rules. Reward roleplaying with XP, and reward it by this much. If that isn’t an attempt to stop the nonsense, I don’t know what is. This chapter has tons of suggestions teaching you how to better craft a story, plot threads, and using vignettes to create meaningful character interactions. There’s also crunch in there for the creation of companion characters, and a way to scale characters of different levels that are adventuring together (as a short term solution). It is a heavy chapter, with loads to take in, but a good one. Again, the developers took another opportunity to emphasize character and story in the game, and in encounters specifically. It also goes back to the first DMG, and touches upon the archetype player types (actor, thinker, watcher, etc.) and how to best tailor encounters to suit their tastes. There’s good stuff here guys, the better you know your players, the better game you can run. Another thing new DM’s can get out of this chapter is the section on how to design better encounters for different sized groups, both large and small. Finally we get more traps, fantastic terrain, and the newly introduced single use terrains, which are awesome and can be applied to many different things, using the example provided as templates. For example, they introduce stats for a large boulder you can push off a hill, in order to roll it over someone. Well, that boulder stat can serve as the stat for a wagon instead, or whatever else you may think is appropriate. Again, good stuff. Ah, the skill challenges chapter. This is what the skill challenge chapter should have been in the first book. This should not have been part of DDI, this should not have been launched the way it was back in June of last year. This is the chapter that should have seen print when this significant new mechanic to the game was introduced. This chapter presents new examples of skill challenges, design advice, and an in depth look at both running and crafting challenges. It also includes one “in play” sample with parts assigned to players and the DM. The sample highlighted is an investigative skill challenge, and it’s a pretty good example, but I still want to see a wilderness travel in play example, or something similar. The chapter does a great job of further explaining skill challenges, and it just may be the thing people needed to get it. The coolest thing here is the introduction of monster themes. Monster themes are a way to add flavor and powers to groups of monsters that revolve around a common trait. A group of Demogorgon Cultists for example, or creatures that are allies of goblins. There are different options that you can apply to monsters, both flavor-wise, and mechanical, to make them grab the feel of the theme you are going for. We also get an expansion of the functional templates from the DMG, and class templates from the PHB2 and Forgotten Realms, so there’s no Artificer class template in this book. Finally, there’s minion creation rules and update elite and solo creation guidelines. This is another great chapter, offering more options for your game, including alternative rewards, new artifacts, and sample organizations. The alternative rewards section includes boons, both divine and legendary, as well as grandmaster training. Divine boons are granted by the PCs’ deity, and are usually in the form of item bonuses to different types of rolls. Legendary boons are granted when completing a specific tasks, and are meant to be storytelling Mcguffins, something the PC’s are searching for, and is potentially introduced early on, and paid off later. Grandmaster training is just that, a training at the hands of an instructor that when finished grants you bonuses. It should be noted that the stat blocks for the boons and grandmaster training are all laid out like magical items, and that’s what they are meant to emulate: magical item bonuses, without an actual physical item. This chapter also touches on campaign arcs, and gives good examples of what makes a heroic tier campaign different from as paragon one, and so on. Any chapter in a D&D book that encourages time travel is good enough for me. And that’s just one of the things your paragon tiered pc’s should be doing. This chapter gives a robust description of what paragon tier play is and isn’t. It also introduces the planar city of Sigil as a paragon tier appropriate base of operations for the pc’s along with a short intro adventure to the tier. If you are remotely serious about being a 4th ed. DM, don’t be on the fence about buying this book. Go get it. You get new traps, terrain, 33 new monsters, artifacts, and great advice. I challenge any critic of the role playing merits of 4th ed. to say something after reading the multitude of storytelling and role playing advise in the book. That argument is done for. You can’t say the game does nothing to encourage role playing when XP is now being awarded for great scenes. Like I said before, this is a great book, and a fine addition to any gaming shelf. I recently received a gift certificate for my FLGS. It’s got DMG2 written all over it! Excellent review. I’ll be picking this up post haste. Thanks! BUT IT’S STILL A MINIATURES WARGAME MANG. IT HAS SQUARES AND BATTLEMATS. YOU CAN’T ROLEPLAY WITH THAT. DURRRRRRRRRRRR. Good review, and I will definitely be getting this book. But honestly, don’t even waste your breath on the people who argue that you can’t roleplay in 4e. They will find new and creative ways to argue with you regardless of what you say or what anyone publishes. Right now you’re just inviting them to argue with you more. A bold move, but a large waste of your time. I agree with Wyatt; don’t bother with the detractors. The complaints being levied against 4E are often just symptoms of a generic dislike for WotC’s new direction, or of the way 3E was cast off, or of X tangentially related issue. If you remove one argument against it, two more will spring up in its place. Improvements to the game will convert some players, and others will find new reasons to dislike it. Meh, we’re enjoying our games, I hope they enjoy theirs as well. 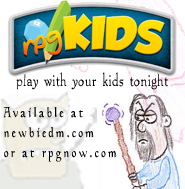 Any game that is tabletop, face to face, and involves a story is gonna be a Role Play game. Unless you’re dealing with a table full of autistic players that’s just the REALITY of the situation. You couldn’t have it NOT be role play even if you wanted to. I’ve been doing that for a good 6 months now. It’s pretty much mandatory IMO. I have to admit I still don’t have skill challenges down and will tend to intersperse skill checks all throughout the game instead – but maybe DMG 2 will help me in that regard. Stormgaard: I think that’s a great way to encourage roleplaying. I haven’t been doing it, bu t I plan to start next session. Dicemonkey: I like the redesign. And the podcast.